Who isn't afraid of the dark? Is anyone truly and completely without fear when confronted with the unknown? Most of us can’t remember the last time we experienced enveloping darkness, much less tasted that fear. We pretend this is a child’s fear, conquered now by living in modern cities with promised, constant protective light. Though forgotten, the fear of the dark is real, and it triggers our earliest collective memories. Imagine standing outside on a moonless night in one of the few remaining places on earth from which no lights or signs of civilization are visible. Blanketed in the blackest night, you could remember the fear of chaos and the uncertainty of the dawn. You could remember, too, the tension of the unknown and tap into the superstitious mind that originally created myths and gods, grasping to bring order to the vast world lying before you. When it comes right down to it, night is terrifying because of the absence of the light. The demise of the day and the onset of the darkness brings an end to what little comfort and control the daylight provides and in turn invites the hand of chaos. To combat the darkness people huddle together around the light of a fire or inside warm, protective structures to await the dawn. With no scientific understanding of the sun, moon and stars, our ancestors created figures of hope to vanquish the night and coax the day. The Guardian of Dawn is the Iron Monkeys’ contribution to this myth. Not a god, but a guardian protecting us from the night. A hopeful and warm place to regroup, recalibrate and resume the journey. The Guardian of Dawn is literally the light in the darkness, a break from the chaos. 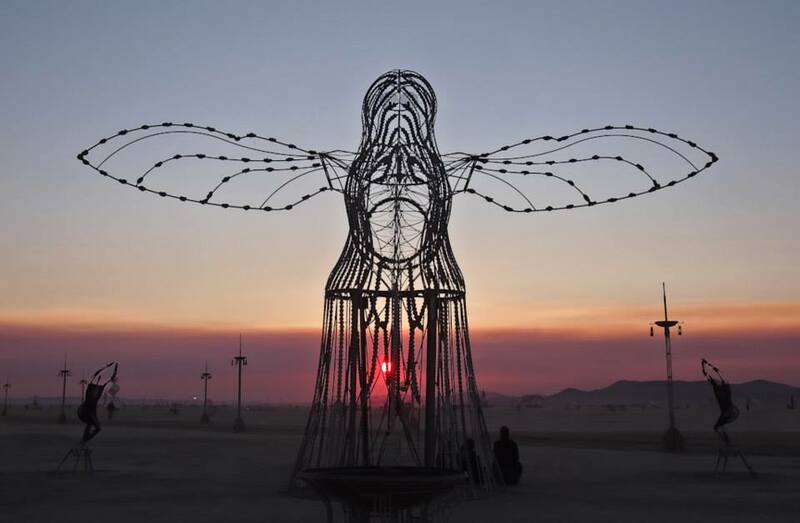 Built with her back to the dawn, the Guardian keeps watch silently during the day, her wings closed, passive in the clarity of the light. With the onset of the darkness she is called to her purpose - wings open, fire beckons, hope maintains through the darkness. Part cargo plane part dragonfly, the Guardian is a mesh of nature and machine, a creation of our human desire to place structure on the unexplainable. Like so many myths that came before her, she is a physical manifestation of the fear and uncertainty inherent in her people, and she offers them what they seek. In this case, she offers hope. To further shatter the oppressive night, surrounding the Guardian are eight acolytes, frozen in poses of exuberance and joy. Monks to the Guardian, the acolytes embody her spirit of protection by holding in their hands either fire or light, warming and enlightening those in the space. Their human forms hold back the darkness by being in constant celebration; perpetual worshipers. Mentors to us on the ground, they help us see how we can fight our own darkness. Won't you come in out of the dark?